We have been involved in hundreds of internet projects that encompass everything from web site design, database-driven web tools for company intranets/extranets, ecommerce systems, internet marketing campaigns and web video. Run as a boutique internet agency, all of Set Now's projects are skillfully executed by veterans and pioneers in corporate communications and electronic media. This hands-on approach distinguishes Set Now – all of our work is done in-house and by accountable team members. Set Now offers unparalleled expertise in designing intuitive internet applications for company websites, extranets and independent online tools. We have experience in developing full-featured online applications that can even integrate to your legacy offline systems. If you can dream it, we can build it. Need help dreaming? LOL, we get asked to do that too! Whether your job is communicating with the public or with your employees, we can assist you in selecting the appropriate internet-based solutions to make you successful in your job. Our careers were forged in a time when 'quality content' was king – and the cost of print or broadcast media meant you had a single chance to get it right. Electronic media has slashed the cost of marketing and communications to almost nothing... Emails don't require postage and YouTube is happy to post your videos for free. But that doesn't mean that the content or presentation of your message should look low budget. Our SEO mindset is in every public website we create. A website should have engaging content that's important to your guests, easy for search engines to index and also please your board of directors. By creating and regularly posting great stories and items of interest you should be rewarded with an appreciative internet following and high search engine placement that's commensurate with your efforts! In the early 2000's as email popularity as a marketing channel really took off, Set Now realized the need for more visually compelling, professionally designed online communications. Businesses needed a tool with the convenience of email, but that provided real-time message tracking and the ability to easily follow-up. Out of their own desire to promote their web development business and looking for a way to showcase their years of professional photography, Set Now Solutions created a custom in-house CRM tool. 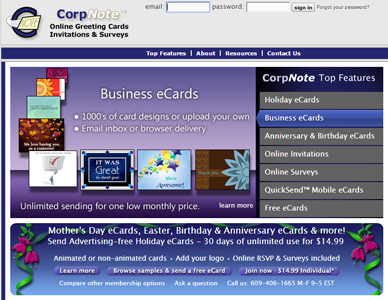 Based on its success, in 2004, Set Now launched CorpNote.com — an advertising-free Online Greeting Card service specifically designed for business. CorpNote at that time was the only product that combined eCards, online invitations and surveys into one integrated product. CorpNote Group members also have the ability to make the entire CorpNote site look like their own website and brand. Set Now Solutions has maintained their devotion to the CorpNote product, and has weathered and adapted to the many shifts in browser and web technology. The rise of social media and the invention and popularity of mobile computing devices, has led to constantly adapting our product to an ever-changing audience. CorpNote is currently used internationally for a wide range of business purposes, including customer relations management, employee recognition programs and event management. For more information, please visit CorpNote.com. If there is a way to use the internet to strengthen the relationship between you and your customers or employees, Set Now would love the opportunity to help you find it. In addition to dedicating ourselves to our clients in a variety of industries, we continue to support and interact with the internet universe through our teaching, involvement and support of community events, and regular contributions to the blogosphere. Our rewards have been measured by the compliments and successes of the people we help. Regardless of the size or complexities of the challenges you present to us, we consider it a privilege to be able to help you as well. Set Now Solutions was founded in 1996 by Sarah Miller. This was back in the day when small business websites were uncommon and you could easily choose your own domain name. She ran the business as a one-woman show, with clients in the banking and publication industries. In 1999 Michael Miller joined Set Now full time, bringing with him years of computer graphics, video editing and multimedia experience. Between Michael's design skills and Sarah's writing and programming experience, the company enjoyed a fast-paced and diverse portfolio of clients, and "ghost" created many web projects for area advertising agencies during the late 90's and early 2000's. Around 2002, Set Now decided to cut the strings with their ad agency clients and focus on working directly with their own clients. This growth period was hallmarked by a comprehensive marketing and branding push, an energetic community education presence and involvement and expansion into the northeastern NJ and PA professional communities. Set Now's clients followed the mold of what we were espousing in our classes and business seminars – that all small businesses can have a custom-designed website that is more than an online brochure. It took some convincing but, today, all of our clients use the internet to interact with their customers and employees and perform their day-to-day operations. From 2003 forward, Set Now increased their staff size and authored a huge number of websites for a diverse assortment of clients. Largely through word of mouth and client referrals, their client portfolio expanded, giving them in-depth knowledge in the fields of banking and insurance, employee benefits, arts and entertainment, corporate communications, accounting and professional services, non-profit organizations and the restaurant/hospitality industries. As their knowledge of these specialized fields increased, so did their aptitude and enthusiasm for creating customized online tools to let these companies run and grow their businesses. To this day, Set Now Solutions continues to support many of these early adaptors of internet-enabled tools and extranets. Their systems continue to adapt, grow and become more intelligent with the opportunities provided by new technology. The technology industry experienced many of the same trends as other industries. Outsourcing to international markets was considered the norm for website production, and there were huge fluctuations in the price and quality of developers, with very few industry standards and no governing bodies. Through it all, Set Now has never outsourced and we have continued to stay on top of the every-changing technology. When smart phones and internet-equipped tablets were being adapted by the masses, it created a new opportunity for Set Now's clients to literally carry their extranet tools into the field with them on a regular basis. Since Set Now has always been cautious about investing too much in the latest, and often untested technologies, our tools and websites have always been custom created using the most widely used technology. As a result, we have been able to transform very gracefully to the new devices and web protocols. This provides a tremendous value and long usable timeline to the systems we've created. We continue to develop new projects using the same principles that we have built our reputation on - select the best technology to meet our client's needs, today, tomorrow and beyond. Social media has also created a tremendous opportunity for businesses to affordably communicate with a larger audience. But at the same time it comes with its own burden: it requires time. By integrating our client's websites to (and from) their social media pages, we've helped them grow their audience with a minimum of required technical know-how and effort. 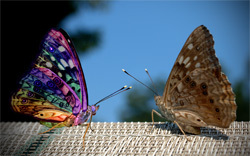 Our expertise isn't just website integration or knowing which keys to hit – we have become a trusted source of advice on how much time to dedicate to social media, understanding which efforts will make the most difference in achieving their marketing goals, and measuring whether their efforts are indeed producing a measurable benefit. One of the greatest skills we've developed over the years is the ability to find, understand and put to use the myriad of statistical data that's being generated by internet activity. Our many years in the industry have given us a deep understanding of website statistics, which is critical to understanding a website's position in search engine results and being able to affect change. Tracking and understanding your site visitor's session path and behavior is essential to improving their online experience and increasing your visit-to-sales ratio. Perhaps the greatest skill that our history has given us is the ability to listen, to ask the right questions and to envision what it's like sitting in the chair of our customers and prospects. So being true to our word – if you've reached this part of our story, then it's surely time we stopped talking about ourselves and turned the attention to you! Please call us or contact us via our online form... we look forward to continuing the conversation!